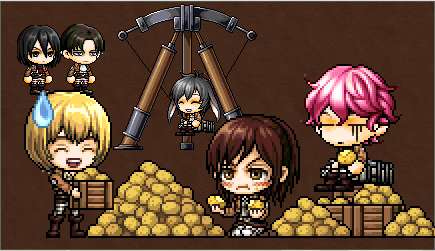 The Attack on Titan crossover with MapleStory is far from over. As such, we are here with another guide for the events Maplers can join during the crossover. Get Play Coins, themed items and more for your MapleStory Mesos hunter. From January 21 to February 18, Maplers can do the Daily Attack on Maple event and the Attack on Mission event. Both events can be taken through the event notifier located on the left of the screen. The Daily Attack on Maple event requires characters level 30 and above to simply log in. Once inside the game, the quest will reward the character with five play coins. Maplers can choose whether these will be five Training Coins or five Wall Coins. Note that only one character per world can receive the reward each day. The Attack on Mission event has players hunt 300 monsters to receive either one Training or Wall Coin. The monsters need to be around the characters level to count. This event can be completed up to five times each day. You’ll be able to get MapleStory Mesos and coins in one go! Running from January 21 to February 18 is the Attack on EXP event. This event is applicable only to Maplers level 30 and up. For this event, players simply need to log in during the weekends. Upon arrival in-game, eligible players will be given eight 1.5x EXP (30 min) Coupons. Note that the coupons can be moved between characters on the account. Additionally, the quest can only be completed once a week per character. Completing the main Attack on Titan event quests and episodes reward players with various themed items. Simply finishing the main story will give Maplers an Other World Regiment Badge. Meanwhile, finishing the mini-games and the Battle of Wall Rose will give players a reward box. Higher ranking will make the box give better rewards. Note however that the rewards are given randomly. These include [Attack on Titan] Totem Pouch, [Attack on Titan] Badge Box, various scrolls, Play Coins and more. To check out a complete list, including the contents of the Totem Pouch and Badge Box, check the official event announcement page. Visiting Star Planet is fun and all, but what’s there to do you ask? Plenty. The Shining Star update also adds Star Plaza World Events for MapleStory Mesos hunters. These events can earn MapleStory items for your character, as well as Star Points. Once on the Star Planet, Maplers can participate every hour between 12 PM and 10 PM PST in Star Bingo. This event can accommodate up to 100 people. Note however that prizes will only be given to the first 30 people who will get a bingo. Additionally, only 50 numbers will be called during this event. Players will get Star points based on their rank. The top player however will receive a Master-o-Bingo Hat along with the points. This prize can be retrieved from Floppy. All players can join as long as they do not have an unclaimed prize from Floppy. Another event players can join on Star Planet is 1 vs 100 Rock-Paper-Scissors. Every :20 mark from 12PM to 10PM PST, Maplers will get invited to join the event. As the name implies, up to 100 players can join. The rules are simple, win or draw against your opponent in Rock-Paper-Scissors to continue to the next round. The amount of Star Points you get depend on how many rounds you win. The overall winner will also get a Kemdi Mask. This can be claimed at Floppy. Every :40 mark in Star Planet, Ryan D. and Sierra Grace will appear on the Shining Stage. Maplers can then take pictures of them to obtain Star Points. The amount of points you get will change with the pose these two take. Players can also test their luck every :30 mark from 12 PM to 10 PM PST. The Lucky Ticket event runs during this time. Tickets can have anywhere from 0 to 3 Lucky Marks. Depending on the marks you have, you can win more Star Points. Those who get all three marks also win a Lucky Lucky Hat. It’s time to send your MapleStory Mesos hunter back to school Sengoku Style! MapleStory is bringing back Red Leaf High and Maplers can have their character earn mesos and MapleStory items in it. Players can earn Totems, stat boosting items and special medals! From November 19 to December 2, Maplers can send their characters back to Red Leaf High. This solo mini-dungeon is open to characters at level 13 and above. Note that players can only enter the dungeon for free, once a day. Succeeding entries will require a Sengoku Class Supplementary Pass available in the Cash Shop for 400 NX. Once inside, players will need to get as far into the school before time runs out. Each room will present the player with a challenge to overcome. Get past it and get through all the room to face the boss of the mini-dungeon, Mori Ranmaru. Maplers can collect Totems through the Red Leaf High mini-dungeon. There are three Totems, namely Sanada Yukimura Totem, Honda Tadakatsu Totem and Uesugi Kenshin Totem. Each one can be equipped and will give your character stat bonuses. Collect all three and you can get the Warring States Manifesto skill from Oda Nobunaga. This skill will summon the Sengoku generals to attack your opponents. Clearing rooms in Red Leaf High awards Maplers with Oda Coins. These can then be exchanged at the Coin Shop for items. Players can get School Bags for 100 Oda Coins each. They give out random rewards including Gold Bonus Potential Stamps, and Dark Onmyouji Effect Coupons. The coins can also be used to purchase other items. Kimono Boxes go for 200 Oda Coins while Kouhai Medals and Senpadi Medals sell for 300 and 600 Oda Coins respectively. Halloween is upon us and MapleStory is helping players celebrate with Halloween Events. Throughout the month of October, MapleStory Mesos hunters can participate in various events for MapleStory items and mesos. Get ready to help ghosts and witches for spooky rewards. From October 15 to October 31, players can help Gamsper the kid ghost get a total makeover. During the event period, players can obtain ghost paint from monsters and Bully Jack. The paint can then be used to give Gamsper a new appearance. When the event is done, players can keep the appearance for their friendly ghost. Players can also receive Gamsper’s Gift Boxes by completing attendance checks during the event. The boxes contain 2x EXP coupons, a Kid Gamsper chair and other useful items. Witch Malady needs help from October 15 to October 31 with her secret mission. Players can hunt Frogs and Black cats in major towns in the game world to receive various spooky ingredients. The witch can then make creepy food concoctions from the ingredients that MapleStory Mesos hunters can use in their adventures. Note that ingredients can also drop from regular monsters in the game. As with most events, only monsters around the character’s level will drop the ingredients. No time to perform the specific Halloween themed quests? Then just hunt regular monsters. As part of the Halloween celebration, from October 6 to October 31, defeated monsters will randomly drop quest items. Collect them and complete the quest and you will be rewarded with a 1-day equipment. Complete all the quests available from the quest items and you will get a chance to obtain rare totems! There are other events running this month. For more information about them, be sure to watch out for our future articles. Happy Halloween! 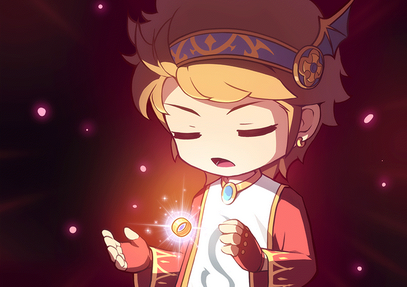 MapleStory is bringing back the Freud’s Journal event. In this event, players can get MapleStory items that can help then collect MapleStory Mesos. It will also reward players with special damage skins. The event quest is quite complex, but fear not as we are here to guide you through it. Freud’s Journal is an event that will run from September 24 until October 21. During this period, characters level 33 or above can participate to earn a Sylph Ring. Note that players that have already done the event cannot do it again. To join the event, simply accept the [Freud’s Journal] Finding the Ring quest. Your character will be automatically teleported to the appropriate map where you can get the ring and the quest. Once your character has received the Revealed Sylph Ring, he/she can improve it by taking the [Freud’s Journal] The Ring’s First Step quest. The latter will require your character to kill 999 monsters within its level range. The next quest to strengthen the ring will then have you kill 1 Normal Zakum. Lastly, [Freud’s Journal] Arnello’s Daily Training, will allow you to improve your Sylph Ring further. The Sylph Ring is cannot be thrown away nor traded. It can however be sold. Be warned though, as once sold, the character can never get another ring again. Depending on the state of the state of the ring, it will increase the stats of your character. Completing the daily Arnello’s Training missions also reward players with Sylph Stones. These can be used on the ring to increase its potency. Finally, players can also receive damage skins from Arnello’s Weekly Goals. These include Sweet Tea Cake Damage Skin, Hard-hitting Damage Skin, Keyboard Warrior Damage Skin and Reminiscence Damage Skin.